Parakeets, also known as budgerigars, or budgies, are beautiful birds. Their colorful features attract millions of pet owners to buy them every year. Unfortunately, although these birds can live in their natural habitat for seven to 15 years, many raised as pets have shorter lifespans. Read on to learn more about how parakeets get their colors and for tips on how to feed and care for your parakeet. In the wild, you would find only the green parakeet with yellow accents and black stripes. Yet, captive breeding programs have produced parakeets in all the colors of the rainbow, except a red or pink parakeet. Although, in the 1800s, there was a scarlet budgie from India that turned out to have painted feathers! The modern pet store parakeet came from Australia, and Europeans bought them by the thousands. However, in 1894, Australia banned the export of native birds. Luckily, European parakeets bred happily, genetic mutations and all. Today's captive parakeets come in two types, based on color. The white-based series has the blue parakeet in sky blue or cobalt. It also includes the purple parakeet in mauve, gray, and violet. Finally, it of course has the white parakeet. The yellow-based series contains the green budgie variations. This includes parakeets in light or dark green, olive or yellow. The different colors result from genetic mutations impacting feather color. The green series with a yellow base boast more dominant genes. Meanwhile, the blue series with a white base have more recessive genes. All colors are shifts away from the base colors. This is mainly impacted by how much yellow and black pigment the parakeet inherited. Every budgie is part of the green series or blue series. Breeding for a specific feather coloration can be tricky. The blue mutation changes feathers from green to blue. It further changes the yellow mask to white. Green in the dominant color and the natural color of wild parakeets. So, it is always noticeable if the required gene is present. If you breed a green budgie with a blue one the babies will be green. Blue budgies don't carry a hidden green gene. Yet, green budgies can carry many hidden mutations. To be sure you will get blue offspring, breed two parakeets in the blue series. You can't really impact your bird's color by the type of food he eats. You can help him have shinier, healthier features that result from good nutrition﻿. Good nutrition will prevent your parakeet from becoming obese or developing liver and other issues that result in early death. Plus, good health improves the sheen of feathers so they reflect light better. This results in richer tones. Your bird no doubt goes crazy over seeds. Of course, seeds are a big part of a parakeet's diet. However, they should make up less than 10 percent of his total diet. Get nutritious parakeet pe﻿llets to form the basis of your bird's diet. They won't be happy about it if this is a change. Yet, it is the best way to avoid obesity and related health issues. Parakeets love vegetables. Green leafy vegetables like kale and dandelion leaves work best. You can also try romaine lettuce, spinach and sprouted seeds. By giving her a variety of vegetables, you are improving the mix of vitamins and minerals in her diet. Calcium is a very important for parakeets. It keeps your bird's bones in good health. Give her hard-boiled eggs with the shells crushed in for a quick dose of calcium. Parakeets like to stay active and play. Get as wide a cage as you can for them to fly around in. Remember, birds fly sideways, so wider is better than taller. There should be enough room for two or more perches. Also, don't forget to get toys that will help stimulate your bird's active brain. Don't put perches over food and water. This prevents feces from getting in the food. Keep fresh water in the cage and change it often. Bathing and grooming decrease dust and dander. Use a spray bottle to give your parakeet a shower. Alternately, place a flat dish of water in the cage. They will roll around on it and splash the water. Parakeets are smart and playful. Exercise and play improve health and lead to a shiny, happy bird. If possible, move the cage around the home. This stimulates the parakeet's brain and keeps them from acting out. The modern rainbow of parakeets has come a long way from the original green parakeets found in the outback. 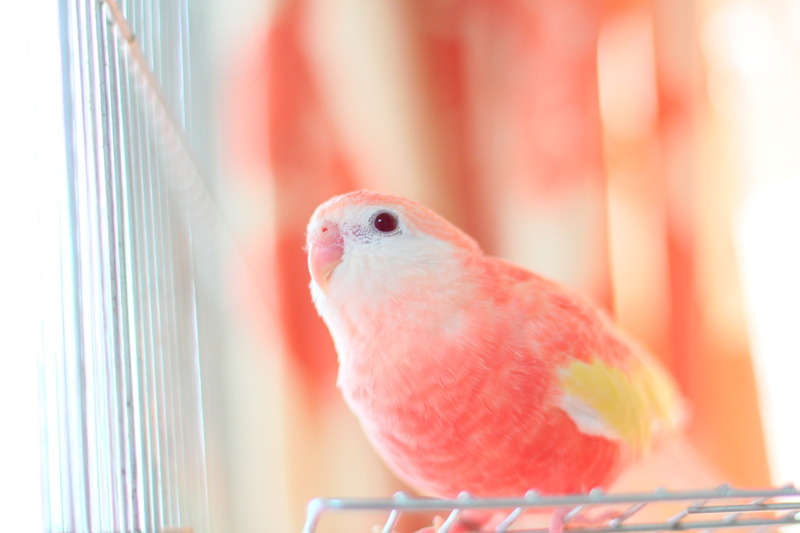 It isn't hard to keep your bird's color keen and vivid. Proper care and nutrition keep you bird bright and beautiful.